Hard drive destruction is the act of physically destroying a computer or media-related hard drive so the data contained on the device cannot be recovered. Physical destruction of the media is a National Association of Information Destruction (NAID)-Certified process and is the only method to ensure your data is not recoverable. This makes it impossible for sensitive financial and other information to be retrieved from the device. In this blog, we share the process and benefits of hard drive destruction. The only sure way to avoid these repercussions is to completely destroy your hard drives. Hard drives destruction works by physically destroying the media where the bits and bytes of data have been written. A specialized mechanism crushes the platter on the drive where sensitive data is stored. When the media has been destroyed, the data is destroyed, then the electronic components are recycled, which we all know is good for the environment. With our NAID AAA Certified hard drive destruction service, your media is destroyed on-site at your business by screened professionals while you watch. You are provided with a Certificate of Destruction with a list of the hard drive serial numbers after your hard drives are destroyed. 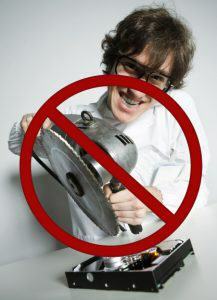 Due diligence is important when choosing a hard drive destruction company. First, identify a provider with an excellent local reputation. Next, because safety and security is essential, check to ensure the hard drive destruction company is AAA Certified by NAID. This certification confirms whether or not your provider’s security practices are verified by an independent third party, thus meeting the highest industry standards. Third, since hard drives contain material toxic to the environment, confirm that the shredded material is recycled and properly disposed of through a state-audited program. Don’t let your confidential data be stolen. Use hard drive destruction as part of your corporate privacy protection strategy. TRexShred offers NAID AAA certified paper shredding and hard drive destruction services for businesses in Dallas-Fort Worth. To learn more about how we can help you, please contact us by phone or complete the form on this page.